Good morning! Before I get started with today’s post, just a little nudge to check out the blog hop I am co-hosting today. Now onto business! 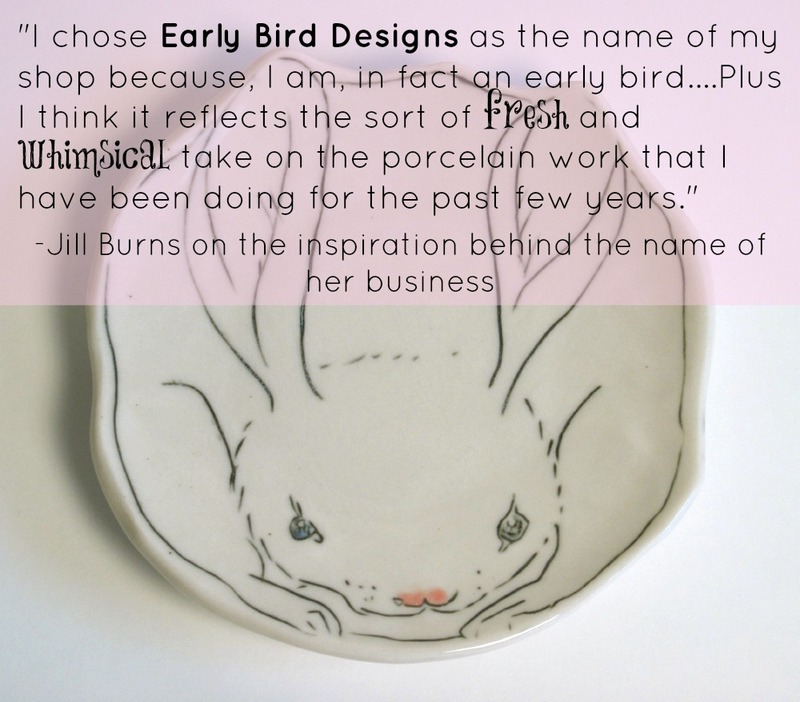 Today I am interviewing the very talented Jill Burns of Early Bird Designs, handmade porcelain pottery. Jill’s background in painting shows in her beautiful pieces with their beautiful designs and attention to detail. In additional to making functional pottery for the homes, including mugs, sushi dishes, and canisters, Jill has collaborated with her two daughters to make personal accessories that incorporate her work into pieces of jewelry. I have to admit, as a creative business owner and the mom to a little girl, I absolutely loved reading this. By the way, today is Jill’s birthday, so be sure to wish her a happy birthday! I studied painting in college, but it wasn’t until my husband and I moved to Worcester that I started working in clay. The Worcester Center for Crafts is a 150 year old institution and a marvelous resource for craft education. It really sparked my passion. I chose Early Bird Designs as the name of my shop because, I am, in fact an early bird. Always have been. I could never sleep late even though the teens years. Plus I think it reflects the sort of fresh and whimsical take on the porcelain work that I have been doing for the past few years. The images that I carve into my porcelain pieces are inspired by 18th-19th century animal and botanical engravings. But I treat them only as a point of departure and try to bring a playfulness to each piece. I want people not to feel that these are precious objects but pieces that can be used everyday. I think it is the human connection. In today’s world where high tech pervades, I think people are drawn to high touch. I have a collection of handmade cups from different ceramic artists I admire. When I have friends and family over they can go the cup shelf and pick a mug that speaks to them. It is interesting to see them really consider the choice and I believe it helps spread the handmade gospel. When you are not making pottery, what do you do with your time? I have always maintained that a career in the arts requires you to be a jack-of-all-trades. You end up doing many things to make it all work. I built and manage a group studio call The Fire Works. It’s a place where ceramics artists can share space and equipment as well as creating a community. I also work at a health education company as an accounts payable clerk. Well…. I really dislike rollercoasters…. haha. I would say really understand the business side of the creative business. Take a business workshop or talk with successful small business people. It’s important to know that you are really making a profit and not just paying for your supplies. 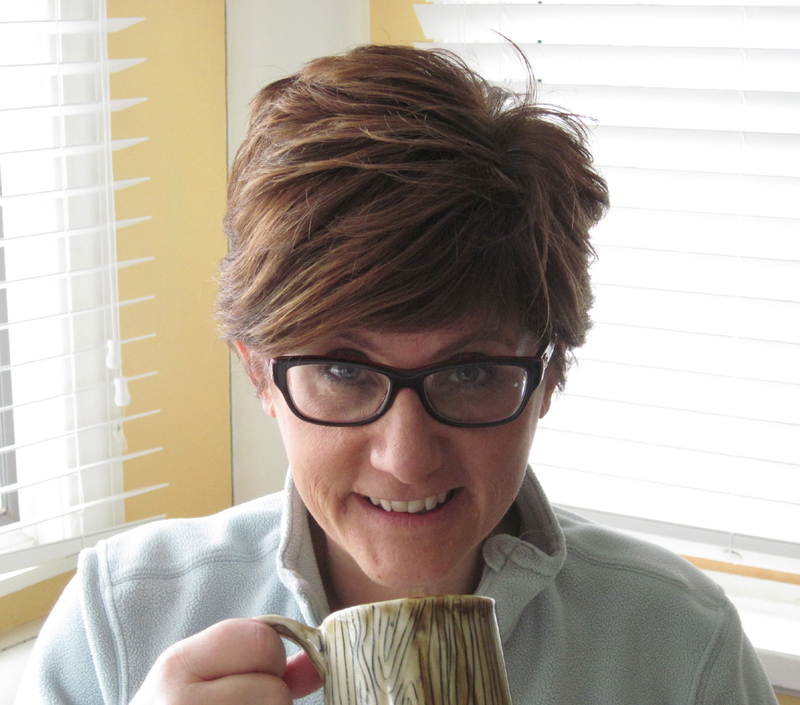 Thanks for joining me on my blog, Jill (and Happy Birthday! ), and be sure to check out her shop. “I think people are drawn to high touch.” What a lovely way to describe our attraction to beautiful, handmade, one of a kind treasures like these pieces! Happy Birthday! And I think you nailed it on the head with being drawn to high touch instead of high tech. I dislike rollercoasters too. Well I think I do. It’s not like I’ve ever been on one to know!